Rockwell and Wingo accept Webster's award from Green Business Challenge committee members. 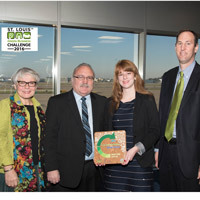 Webster University was granted second place for the Award of Merit from the St. Louis Green Business Challenge for its sustainability initiatives in 2016. The University competed in the 2016 challenge at the Leaders level. At the Leaders level, the Award of Merit is presented to top finishers showing the greatest gain in points from their baseline to final point totals. Webster University’s 2016 scorecard showcased advances in education and outreach through the Gorloks Going Green (G3) Sustainability Peer Educator program, as well as illustrating campus recycling practice improvements and highlighting strides in wetland restoration at the Natural Area. Kelsey Wingo, Webster sustainability planner, and Rick Rockwell, chief communications officer, accepted the award on behalf of the University at a Dec. 2 ceremony. Also pictured above are St. Louis Green Business Challenge committee members Jean Ponzi, who is resource manager for the EarthWays Center with the Missouri Botanical Gardens, and Eric Schneider, who is senior director of policy development for the St. Louis Regional Chamber of Commerce. Read more about the St. Louis Green Business Challenge at stlouisgreenchallenge.com, or contact Wingo at kelseywingo07@webster.edu.